Or – please explain to me!!! unnAlE – because of you (and me) (there by saying that the mother-son relationship that SrI rAmAnuja and maNavALa mAmunigaL shares would lead the world to say that it is the fault of the mother and not the son for not protecting the child. In this pAsuram, maNavALa mAmunigaL replies to a question posed by SrI rAmAnuja. SrI rAmAnuja asked him, “You said that I need to protect you by performing the tasks on behalf of you just like how a mother protects her child. But look at you. Your bad karma is growing and you do not have any good karma to begin with. How can I protect such a person? maNavALa mAmunigaL replies that if SrI rAmAnuja does not protect him, then it will cast a black mark on SrI rAmAnuja. This point is being illustrated with an example of a beautiful analogy where people would blame a mother if something happens to her child who does not know how to take care of itself. SAsthram says that if a child under the age of 5 dies, then it is the fault of the mother for her carelessness that caused the death. If a child who is under the age of five dies unexpectedly, SAsthram says that the fault falls upon its mother for her negligence. In order to eschew this, a mother should always guard its baby with vigil. The mother should be awake and alert as if she had applied butter in the eyes. Let us say for example that she has a child, who is very young (less than five), goes near a well that is very big and deep. Even though the mother does not see the child going, if something bad happens (child falls in the well and dies), the fault will be borne by its mother. The world will tell that the mother saw the child yet did not pay attention to it. maNavALa mAmunigaL says “Oh! yathirAja!!! Similarly, even if adiyEn, who is in the abysmal pit of bad karmas (sins), tries to destroy myself, then please remember the relationship between you and me. You are my mother and I am your son. This very relationship will land you in trouble as the mother will have to be responsible for the child’s death. Hence please look at our relationship carefully and examine my condition again. Hence, adiyen requests you to protect me at all times, just because of our relationship. At this juncture, we need to recollect the same thought that is being told by piLLai lOkAchAryAr in his SrIvachana bhUshaNam sUthram #371 “prajayaik kiNaRRin karayil ninRum vAngAdhozhindhAl thAyE thaLLinAL ennak kadavadhirE”. 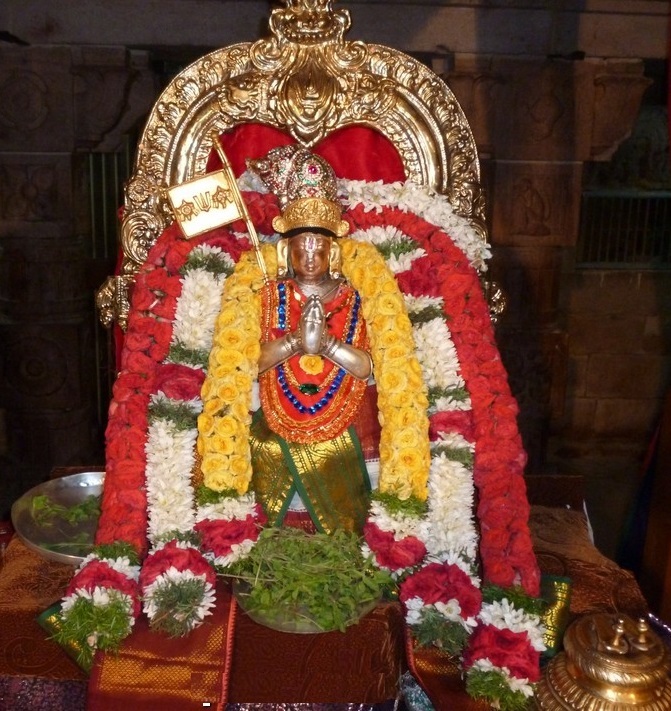 maNavALa mAmunigaL’s shrewdness is to be observed in this pAsuram. He simply does not imply that just like how a mother is responsible for her child’s death, yathirAja is responsible for his (maNavALa mAmunigaL’s) sins. He simply does not mean that here. He says that only his (maNavALa mAmunigaLs) karma is responsible for him to fall in the abysmal pit of sins and consequential sufferings. yathirAja is no way connected for his sins. However, he tells yathirAja to think about the relationship he shares with him (maNavALa mAmunigaL) which is “mother-son” relationship. As a result of this relationship, he maNavALa mAmunigaL asks yathirAja to come to his rescue, failing which the world will talk ill of yathirAja for not protecting him when he was going to perish. This entry was posted in Arththi prabandham, Other and tagged arththi prabandham, mamunigal, ramanuja on June 21, 2016 by santhanam rajagopalan.